The Acclaimed Imprint Highlighted All Month Long! San Diego, CA (August 15, 2013) – Throughout the month of November, IDW’s award-winning Artist’s Edition format will be featured on some of the biggest titles hitting comic shops! A number of stellar issues will offer unique variants that showcase the raw art of comics’ best and brightest. Artist’s Editions have transformed the way fans look at original art, and these tongue-in-cheek tribute covers pay homage, as if taken straight from the drawing board! 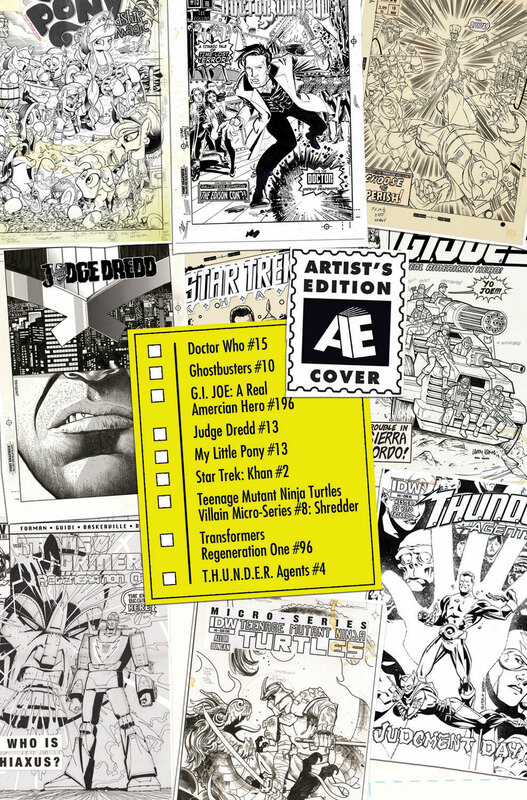 My Little Pony, Judge Dredd, Ghostbusters, Transformers, Doctor Who, G.I. Joe, Teenage Mutant Ninja Turtles, Star Trek, and one of IDW’s newest series, T.H.U.N.D.E.R. Agents will all offer Artist’s Edition variant covers! Andrew Griffith, Dan Duncan, Jim Rugg, Mike Collins, and Andy Price are just a few of the big names that will be showcased. As the number of conventions across the globe grows each year, the opportunity to get sketches by iconic artists has never been easier. 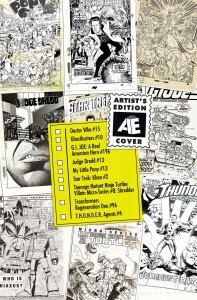 So to help your personal Artist’s Edition library stand out even more, IDW will also be offering blank sketch cover variants for the aforementioned titles as well! Artist’s Editions have become essential for any collection, and this month everyone will get the chance to see why! This entry was posted in Columns and tagged Andrew Griffith, andy price, Dan Duncan, idw, jim rugg, Mike Collins, scott dunbier. Bookmark the permalink. Follow any comments here with the RSS feed for this post. Post a comment or leave a trackback: Trackback URL.